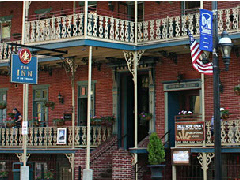 It may be in the heart of Pennsylvania, but the Inn at Jim Thorpe is distinctly New Orleans-esque. With a Victorian flavour to the interior, it offers 34 guest rooms, including 11 suites. Built on the site of the former White Swan Hotel which was destroyed by fire in the late 1840’s, the hotel has played host to famous guests from a wide variety of backgrounds: Thomas Edison, Buffalo Bill, and John D. Rockefeller among them. Towns such as Bethlehem, Allentown, Wilkes-Barr and Scranton are all within reasonable driving distance.